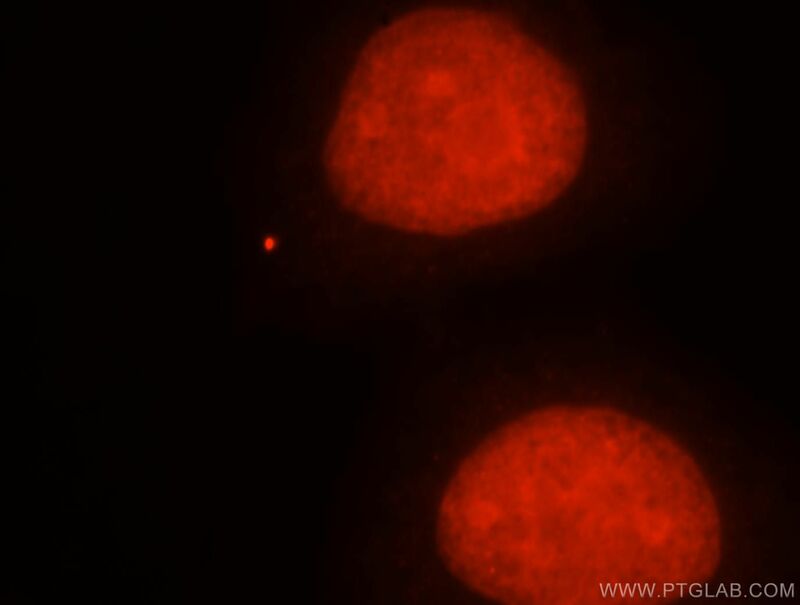 Immunofluorescent analysis of MCF-7 cells, using APEX1 antibody 10203-1-AP at 1:25 dilution and Rhodamine-labeled goat anti-rabbit IgG (red). 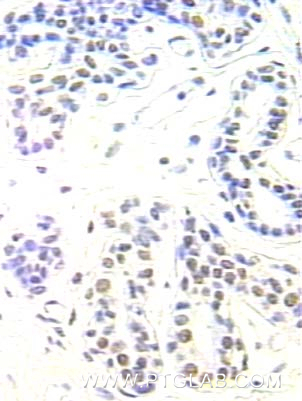 IP Result of anti-APEX1 (IP:10203-1-AP, 4ug; Detection:10203-1-AP 1:1000) with HeLa cells lysate 1600ug. APEX1, also named as APE, APE1, HAP1 and REF-1, belongs to the DNA repair enzymes AP/ExoA family. It is a multifunctional protein that plays a central role in the cellular response to oxidative stress. The two major activities of APEX1 are in DNA repair and redox regulation of transcriptional factors. APEX nuclease is a DNA repair enzyme having apurinic/apyrimidinic (AP) endonuclease, 3-prime,5-prime-exonuclease, DNA 3-prime repair diesterase, and DNA 3-prime-phosphatase activities. On the other hand, APEX1 also exerts reversible nuclear redox activity to regulate DNA binding affinity and transcriptional activity of transcriptional factors by controlling the redox status of their DNA-binding domain, such as the FOS/JUN AP-1 complex after exposure to IR. APEX1 is involved in calcium-dependent down-regulation of parathyroid hormone (PTH) expression by binding to negative calcium response elements (nCaREs). When acetylated at Lys-6 and Lys-7, APEX1 stimulates the YBX1-mediated MDR1 promoter activity, leading to drug resistance. It also acts as an endoribonuclease involved in the control of single-stranded RNA metabolism. It plays a role in regulating MYC mRNA turnover by preferentially cleaving in between UA and CA dinucleotides of the MYC coding region determinant (CRD). In association with NMD1, APEX1 plays a role in the rRNA quality control process during cell cycle progression. 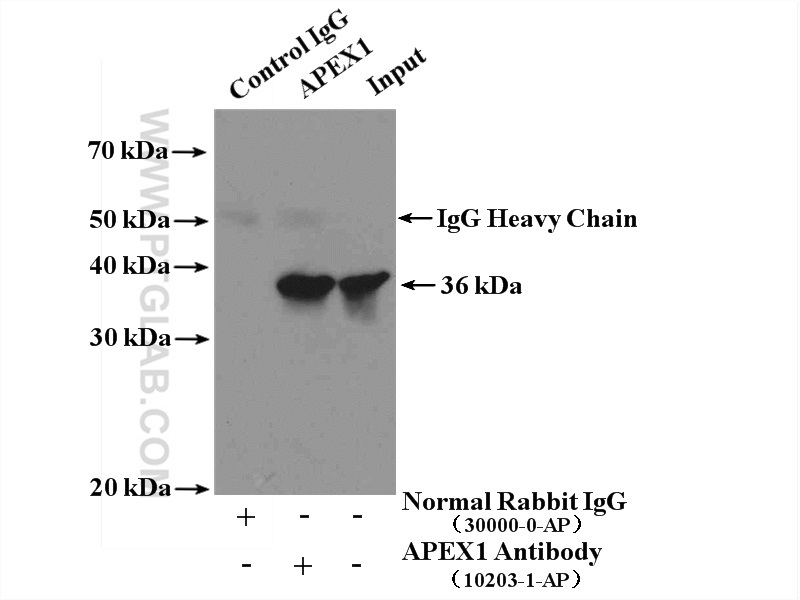 10203-1-AP is a rabbit polyclonal antibody raised against full length APE1 of human origin. Induction of base excision repair enzymes NTH1 and APE1 in rat spleen following aniline exposure. Suppression of oxidative phosphorylation in mouse embryonic fibroblast cells deficient in apurinic/apyrimidinic endonuclease. Polychlorinated biphenyl quinone induces oxidative DNA damage and repair responses: The activations of NHEJ, BER and NER via ATM-p53 signaling axis. miR-130a can predict response to temozolomide in patients with glioblastoma multiforme, independently of O6-methylguanine-DNA methyltransferase. Systematical exploration of transcription factors in cardiomyocytes against hydrogen peroxide-induced oxidative stress by Danhong injection.